Dayton, Ohio was another important site of the Manhattan Project’s top-secret work. In 1943, the MED tasked the Monsanto Chemical Company with separating and purifying the radioactive element Polonium (Po-210), which was to be used as the initiator for the atomic bombs. To lead the Project, Brig. Gen. Leslie Groves selected Dr. Charles A. Thomas, Monsanto’s research director who had already turned down an opportunity to become co-director at Los Alamos with J. Robert Oppenheimer. Monsanto’s subsequent polonium research, development, and production activities occurred at several sites in the city of Dayton and became known as the Dayton Project. From April 1943 to August 1944, Manhattan Project scientists raced to find an initiator, codenamed Urchin, for the implosion bomb that was being designed at Los Alamos. In order for the atomic bomb to detonate properly, the initiator had to produce neutrons within the supercritical core at exactly the right time. If neutrons were released prematurely, the resulting explosion would be a “fizzle” well below the designed yield. If neutrons were released too late, the bomb may not explode at all. In 1944, physicist Edward Condon proposed that Polonium-210, in combination with Beryllium, could be used as the initiator device for the atomic bomb. Polonium, which was discovered by physicist Marie Curie in 1898, is a peculiar, soft metal which is dangerous to inhale and very difficult to produce. Since there had never been enough Polonium produced to conduct experiments, there was considerable doubt that it could be sufficiently purified or produced in time to make a difference in the war. With no other alternative, scientists had no choice but to try. Beginning in 1943, Monsanto used its Central Research facilities at 1515 Nicholas Road to organize the Polonium project and recruit scientific personnel for the program. The facility was subsequently designated as Dayton Unit I. Though Po-210 was never produced or refined at this facility, scientists did perform spectrographic and x-ray work on Polonium and developed the refinement process that would be used at Unit III. In 1943, the Monsanto Chemical Company expanded and acquired the former Bonebrake Theological Seminary for the research, development, and processing of polonium and subsequently renamed the site Dayton Unit III. Almost every week, a large truck carrying hundreds of bismuth slugs would arrive from Oak Ridge, Tennessee, where the slugs had already been irradiated via neutron bombardment. Workers at Unit III were tasked with separating the polonium using acid extraction methods and assembling the triggers for the atomic bomb. In 1944, the US government acquired the Runnymede Playhouse for the polonium separation process (which now required additional space) through eminent domain. Originally part of the Talbott family estate, Runnymede Playhouse served as a social and entertainment center for the Oakwood community. The playhouse was constructed in 1927 by Katharine Houk Talbott, a prominent figure in Dayton’s social and cultural life and the late wife of Oakwood’s first Mayor, Harold Talbott. Katharine Talbott died around 1935 and in 1937, her heirs had the main mansion demolished to increase the value of the property. The Playhouse was left intact but without a sponsor to continue its role as the center of Oakwood recreation and entertainment. The massive glass-topped playhouse included a luxurious ballroom, indoor tennis and squash courts, a stage and balcony, a spacious greenhouse, card rooms and a lounge. Throughout the 1930s, the playhouse was used for dances, graduations, and music recitals and served as a popular venue for social gatherings and community meetings. When Runnymede finally became operational, it looked nothing like a playhouse. Floodlights and heavy duty power lines were strung around the property, and big, unmarked trucks rolled in and out. Guard houses were constructed and a barbed-wire-topped fence surrounded the grounds. At Units III and IV, forty-three armed guards kept unauthorized individuals out and maintained an eye on the employees. To conceal this suspicious activity, Secretary of War Henry L. Stimson stated that the Playhouse was being used as a film laboratory for the Army Signal Corps. The Bismuth slugs that arrived at the Playhouse were kept in either a specially shielded vault or under water in a tile-lined pool. At the Playhouse, the aluminum jackets were dissolved and the Bismuth yielded, depending on its purity, between six and sixteen grams of Polonium. 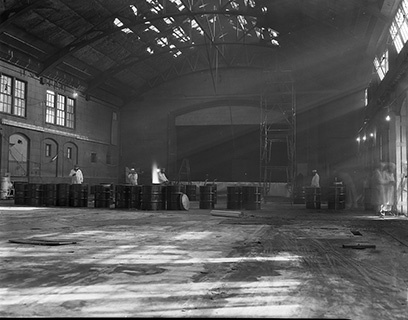 Over fifty tons of radioactive Bismuth were processed at the Playhouse between 1943 and 1945. By 1950, the playhouse had become so contaminated with radioactivity that decontamination was impossible. The radioactive parts of the playhouse were demolished in 1950 and buried at Oak Ridge. The uncontaminated portions were buried at Mound Laboratory (see below). Shortly after the war, the MED began construction on a new facility to continue the polonium-related work being done at the Dayton Units. Located at southern edge of Miamisburg, between Dayton and Cincinnati, Mound Laboratory became operational in 1949 and was the United States’ first Post-War Atomic Energy Commission site to be constructed. Scientists at Mound Laboratories continued to research and manufacture polonium-based initiators for nuclear weapons throughout the Cold War. Their research also included exploring alternate fuels for the initiator, since polonium-210’s relatively short half-life meant that the initiator would need to be replaced every five months. Two elements of interest were actinium-227 and polonium-208, which had longer half-lives. Over time, Mound operations grew to include research on radionuclides, tritium recovery, power sources for the space industry, and other nuclear-related weapons. In 1961, scientists at Mound began researching plutonium-238 as a potential source of heat and electrical power for spacecraft. Since their development, these units (called SNAP or Systems for Nuclear Auxiliary Power) have been used on a variety of space missions and have helped power weather and navigational satellites. In 1994, all production and research at Mound, with the exception of the SNAP program, officially ceased and cleanup of the site began the following year. The Mound Science and Energy Museum was later established to preserve the remaining heritage of the Mound Laboratory, its workers and its site. For more information about the Manhattan Project at Dayton, see Linda Carrick Thomas's book Polonium in the Playhouse: The Manhattan Project's Secret Chemistry Work in Dayton, Ohio. Unit IV interior; workers with several 55 gal. drums on otherwise empty floor. Photo courtesy the Mound Museum.